Editor’s note: Dylan Jones is a Summer Intern from the USA for JJ Kavanagh & Sons. He will be travelling to our key destinations on day trips and bringing his thoughts from a tourists perspective. Hope you enjoy his honest feedback! For my most recent day trip, I got the opportunity to tour my newly adopted home of Dublin this past week. 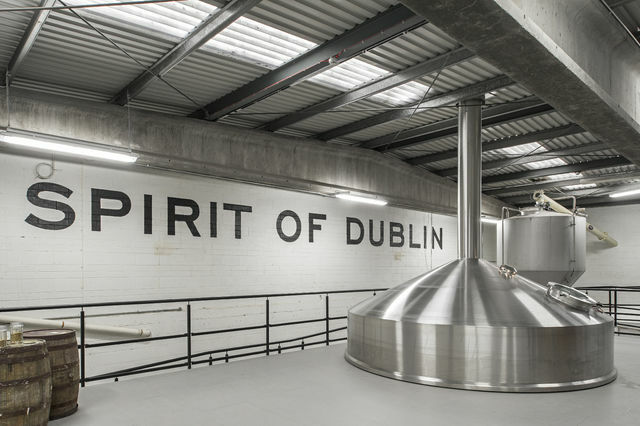 During my day out, I visited a few of Dublin’s must-see attractions such as Croke Park Stadium and the Stadium tour, the Ericsson Skyline tour at Croke Park, and the Teeling Distillery. To clinch my hunger from the excitement of the Skyline tour, I ate an amazing lunch at Bread and Bones, and its unique selection of burgers and sides. There was no better way to start the day than waking up and heading to Croke Park for a beautiful skyline tour. With the weather being in my favor, I was in for a treat! Although I was lucky with the blue skies, I was told it does get a bit cold at the top and can get very windy as well. The tour started off with a brief bit of history of the park followed by an introduction of our tour guide, Magda. She was very courteous and was set on making sure each person on the tour was satisfied with the experience. Soon after our initial briefing, we strapped on our safety harnesses and were ready to go! This might sound a bit intimidating, especially for those with a fear of heights, but the safety harness was there only as a precaution as the roof was still under you for MOST of the tour. 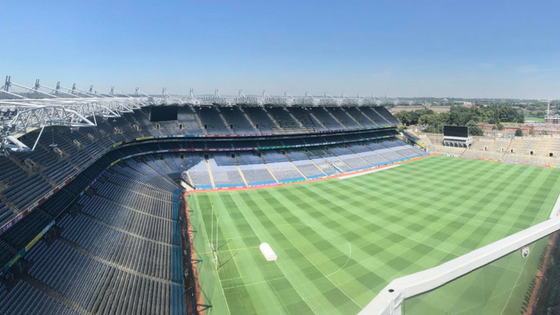 The team at the Skyline tour have done an excellent job to ensure that you feel safe and secure while touring the upper reaches of the stadium, giving those on the tour the ability to feel comfortable enough to take in the incredible views of the city. As the weather was clear and sunny, I was able to see some of the most important landmarks in Dublin including the Glasnevin Cemetery, Kilmainham Gaol, the Guinness Storehouse, Dublin Castle, and the famous Sugarloaf Mountains! 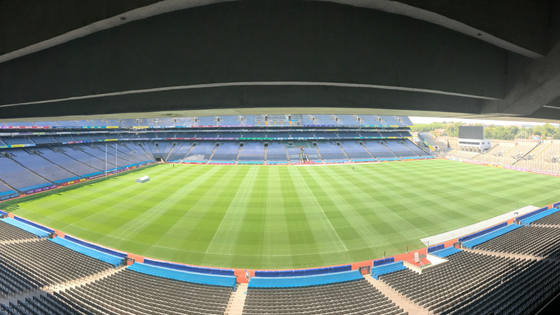 Near the end of the tour, you get the opportunity to hook your clip on the steel railing and get to see an incredible view of the pitch from above the level 3 seats! 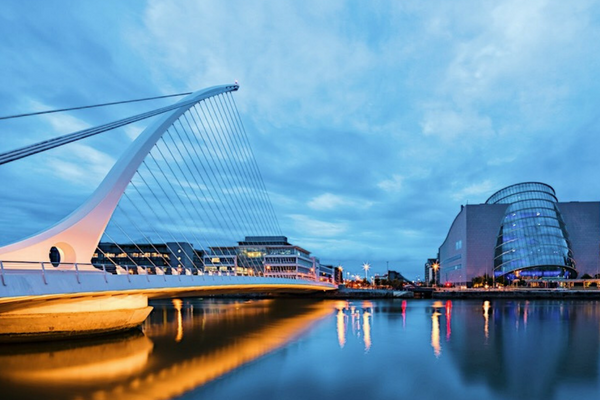 I would recommend this tour if you’re in Dublin, and looking for some astonishing views, along with an adrenaline rush of climbing to these heights. A special thank you to the team at Skyline tours for making this a great experience! After the skyline tour was over, I dove right into the Croke Park Stadium tour! Being a big sports fan in the United States, I have a relatively small amount of exposure to Gaelic sports. After watching the 12-minute video on the history of sports in the stadium, I was ready to go witness a match as soon as possible! The hype in the atmosphere gave me the chills just watching it on the big screen. Once the video was over, it was time to start the tour! We began with the locker rooms, which were unique because they had each one of the jerseys from every Gaelic football team competing in the competition. Our tour guide, Pauly, was devoted to the sports and showed a lot of passion in describing the history of the matches. It was interesting to see how they get ready for the large crowds as Kilkenny was getting ready to take on Galway in a match that Sunday! I would highly recommend going during this time as you can see what really goes into the preparations for these matches. It truly is an amazing experience for the average sports fan! After going into the lounges and locker rooms, it was time to hit the pitch! The first thing I noticed walking out of the tunnel was the beautiful color of the grass. The grounds are very well taken care of and the smell of the fresh cut field made me want to get out there myself and play. One of the things that is inspiring about the stadium is to think about the 82,000 fans cheering for their county team and what an unimaginable experience it would be! From here, we went into a suite on the club level of the stadium. I couldn’t even begin to imagine what it would be like to watch a championship match in those seats or even a concert! Even if you aren’t a huge sports fan, the stadium tour is a must do if you’re in Dublin! After my time at the stadium, I had worked up an appetite and found that there was nothing better than a Bread and Bones Gourmet burger to satisfy my cravings. If you are hungry and in the mood for a meaty burger with some unique toppings and side items, this is the place to be! Our waiter, Jack, greeted us as soon as we walked in welcoming us with open arms. He then let us know what their daily specials were and what they are known for on the menu. Being from the United States, I really was missing the flavor of a good BBQ, so I ordered the BBQ burger and I had absolutely no regrets. 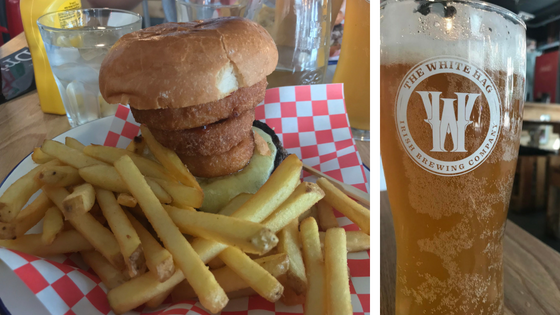 Led by a staggering tower of Onion rings, this burger was a true test to devour! It might take a little while to eat, but man was it satisfying! If you are in the mood for a good pint with your meal, I’d suggest getting the Ninth Wave Pale Ale, it will not disappoint! There was no better way to end my day than learning some interesting facts and having the opportunity to try some of the worlds tastiest whiskey at Teeling Distillery. After watching a video on the early productions of the distillery, we had the opportunity to walk around the actual distillery itself. What I found interesting was that the tour of the distillery takes you through the heart of the production process, which allows you to see the different stages in the process in real time! They use a mix of new and old techniques to perfect their whiskey. I would recommend wearing something light as it does get warm in the distillery due to the making of the whiskey. The tastings for the whiskey were well organized and were waiting for us as soon as we entered the tasting room, which I found was very pleasant. Teeling’s really does pay close attention to their customers and the service we received while in the tasting area was outstanding. As a special bonus, everyone in the group received a free Irish coffee at the end of the tour. If you are really into whiskey culture, I’d definitely recommend getting the bigger package, which gives you two extra whiskeys to try. Even if you aren’t the biggest whiskey fan, you will still enjoy the tour and have a great experience learning about one of Ireland’s great exports! JJ Kavanagh & Sons have 52 bus services daily to Dublin City Centre from 20 locations across the South East of Ireland. The drop off points in Dublin City are Heuston Station and Eden Quay. The pickup points are from Ulster Bank, Georges Quay, and Heuston Station.